Maha Shivratri na Shubh Avsare Chalo, Maa Umiya ne Dwar…. The Grand and Historical event of Kadva Patidar community project by Vishv Umiya Foundation Ahmedabad Gujarat. 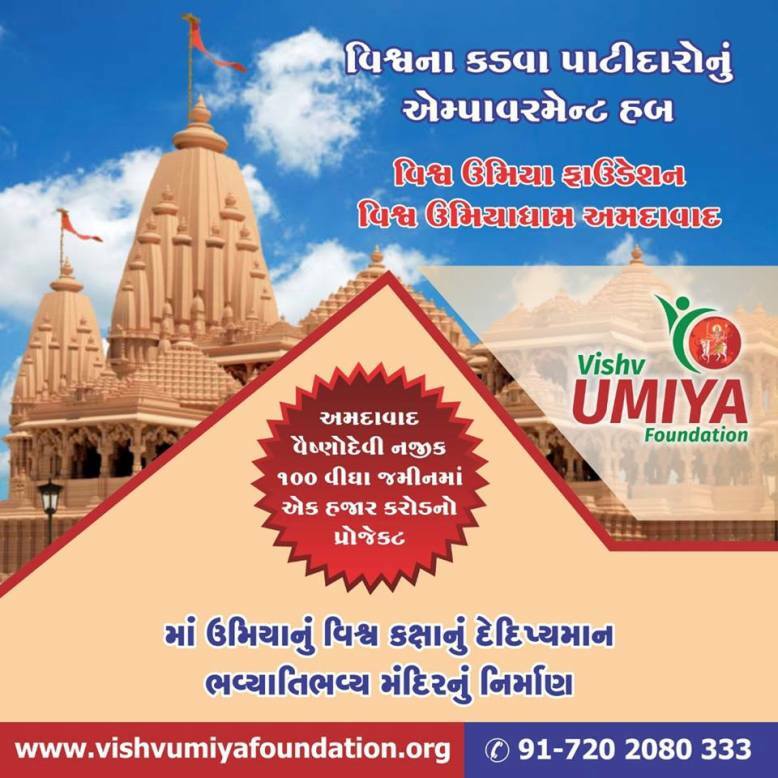 Shree Umadham International Temple Vishv Umiyadham New Project Maha Bhumi Pujan Samaroh 2019 is going to be held on 4th March 2019, Monday. Kadva Patidar Empowerment Hub & Umiyadham Ahmedabad has organized 11000 patla pujan in Ahmedabad. Maha Bhumi Pujan Samaroh Inauguration Ceremony by Shri Narendra Modi. There will be Pratima Darshan, Sanskrutik Karyakram, Patidar No Itihas etc. Jagat Janani Maa Umiya Na Mahapuja Ma 11000 patla pujan yagman. Last date for registration is 22nd February, 2019. So register your name now to be the part of Maa Umiya Temple Maha Puja. Maha Bhumi Pujan Samaroh is on auspicious day of Mahashivratri. 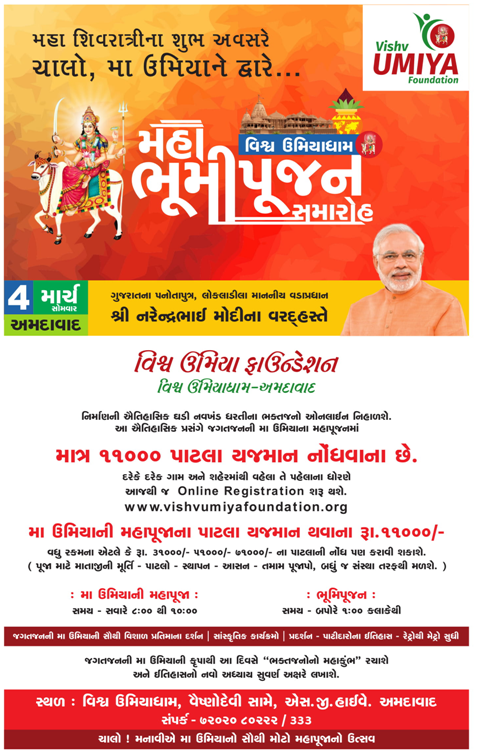 Vishv Umiya Foundation (VUF) is making goddess Umiya Mata Temple as kuldevi by Kadva Patidars. It will also have hospital and healthcare facilities, sports and cultural complex, education institute and hostels for boys and girls. Devotees can watch live the full ceremony. All the Bhakts are invited to be the part of the most happening event of Bhumi Poojan on 4th March 2019 in Ahmedabad.